Parents are struggling across the globe to raise respectful, obedient, loving and well-behaved kids. And yet there are “experts” around every corner who are almost shouting parenting tips that are “guaranteed” to create calm, sensitive, polite and well-rounded kids. Yet, we continue to see a trend of bad behavior in children. And that trend is gaining ground. Kids are yelling at their parents. “I hate you!” and “Shut-up!” are not the rarity anymore. In fact, thousands of moms have flocked to social media to air their grievances of these outbursts. Kids don’t immediately say such things with passion. Could there be parenting tips that parents are choosing to follow because “experts” in their lives have sworn by them? Could it be the “parenting experts” have actually sworn by a few tips that are actually creating bad attitudes? If you’ve read my post that resonated with hundreds of thousands of parents about cranky toddlers, then you know I’ve admitted to messing up on my parenting adventure. In fact, I still continue to miss the mark! But I’ve learned that certain childhood behaviors escalate if they’re not addressed. After teaching kids for over 16 years I’ve observed a parenting pattern that reflects in each child where parents follow these four popular parenting tips. That’s not to say those parents don’t mean well! And my desire is for this article to reach a parent who has followed all the parenting advice but has yet to see solutions. I desire to offer modern parents hope when it seems their family life has to continue in arguments, strife and tears. And we welcome emails from parents who truly desire to find help! 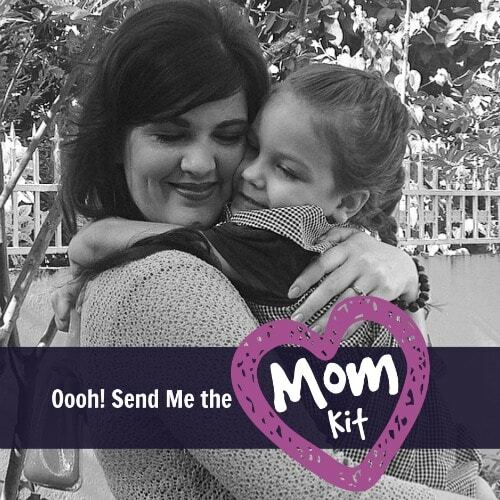 And if you’re a mom who wants to get a head start on her mom journey, we’ve created a HUGE mom kit just for you! It has loads of printables to inspire you to love motherhood once again! You can snag yours here! Reward whining. Magazines, talk shows and even …ahem…blog posts call out those times when your child is irritable, tired or whining about the wrong color cup at breakfast time and tell parents it’s ok to give in and give your child what she wants. I personally know many well-meaning parents who hurriedly replace the blue cup with the most enviable red cup. If their child is complaining about lunch, they offer the child another lunch option — like macaroni and cheese or chicken nuggets — instead of the chicken vegetable soup everyone else is eating. But what do you think — super-smart, critically thinking parents? If parents continually reward whining they create a self-centered, complaining child who is rarely content. And yet, the parenting experts continue to teach that it’s ok to give into a child’s whining, demands and complaints. Here’s my humble opinion: sometimes being an awesome parent means being the “bad guy” for a little bit in order to be the “good guy” in the long run. Parenting isn’t for the weak! It takes a strong parent to act against their misleading emotions in order to do what they know is the absolute, long-term best for their child — even when their child screams, kicks and cries. Address violent behavior with affection. I was kind of shocked three years ago as I watched parenting television shows that were discussing how to handle a child’s violent behavior. Do you know what they said was the best reaction to a violent child? Let me just be crystal clear about the bad behavior we’re discussing. We’re talking about kicking, hitting, pinching — violence! Parenting experts are encouraging parents to give bear hugs as a reward to someone who just power kicked an adult. Singing lullabies and rocking a toddler who just smacked his mother in the face is highly encouraged. Since when did it become ok to be violent to other humans beings?! FACT: Someone who harms another being should never receive a hug as a reward. I’m a huge proponent of spending loads of times with your kids and smothering them in hugs and kisses! But, hitting, kicking, pinching, biting? Actions that inflict pain on other people should never, ever be allowed. But when violent behavior does take place, it should only be met with consequences — not rewards. Rewarding violent behavior only encourages it to continue. Should we hug our kids when they steal? Should we give them kisses when they cuss? If we think it’s insane to reward a child for that type of bad behavior, why would we believe the popular parenting advice to show affection when our child has harmed another individual? Let’s be thinking parents on our parenting journey! Give kids the option to obey. Obedience to parents should not be optional, but some well-known parenting experts are encouraging parents to give their kids options when it comes to obedience. On the surface, that sounds like peaceful, kind and patient parenting. But if you dig a little deeper, you may come to the conclusion that giving kids options when it comes to obedience actually encourages them to decide when they should obey parents. And that can be a dangerous decision for a young mind to make. Obedience to parents is actually a safety net for children and prepares them to follow authority in real, adult life. Parents want what’s best for their kids and guide and protect them through love, commands and guidance. And if imminent danger ever becomes reality in your life, you will be glad that obedience wasn’t an option for your child. In that moment, your child’s very life could hang on the fact if she was taught always obey her parents or if obedience to parents was an optional choice. Only address bad behavior 60% of the time. Teaching children to become well-behaved is much like any other healthy habit in life — it has to be consistent! We can exercise faithfully for one week, but if we only exercise every other ten days after that first dedicated week, we won’t see lasting results. The same principle applies to parenting. We have to love our kids 100 percent of the time. We have to address bad behavior 100% of the time. But parents often think it’s ok if they let things go. In fact sometimes they’re encouraged to let things go on their parenting journey. Because it’s just too hard to be diligent. But if you want to see your child’s behavior go from bad, negative and aggressive to loving, kind and affectionate you absolutely have to be ready to parent at any given moment. It’s annoying to stop conversing with an adult to focus on a child who is deliberating disobeying your rules, isn’t it? The more you’re consistent, the less tantrums, meltdowns, and negative behavior you’ll see. 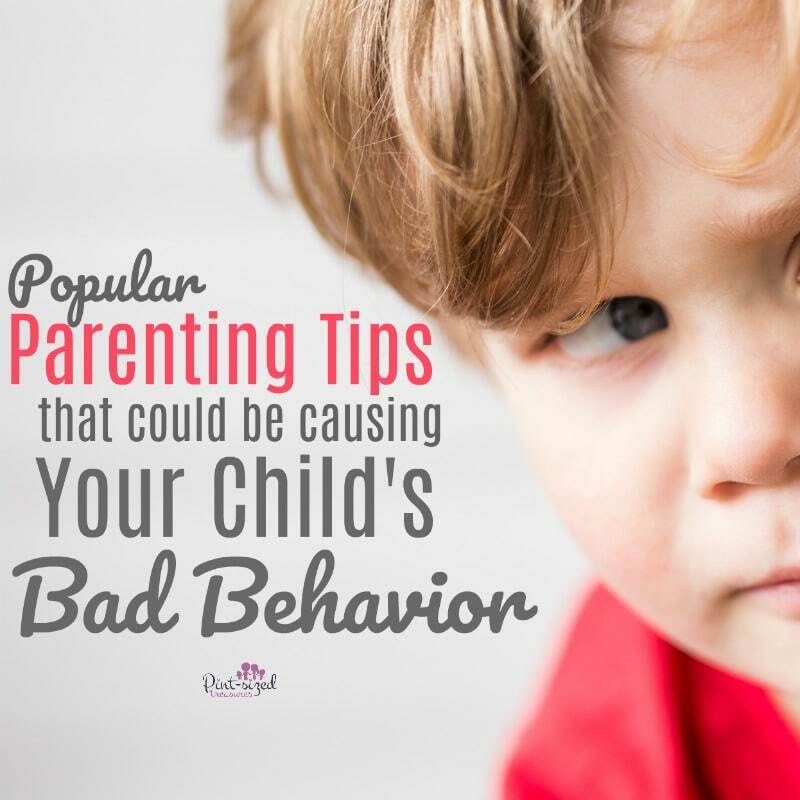 If you only address your child’s negative behavior 60% of the time then you will have a child who acts out, disobeys and causes havoc more than 60% of the time! Because your child is counting on you to be lazy this one time. 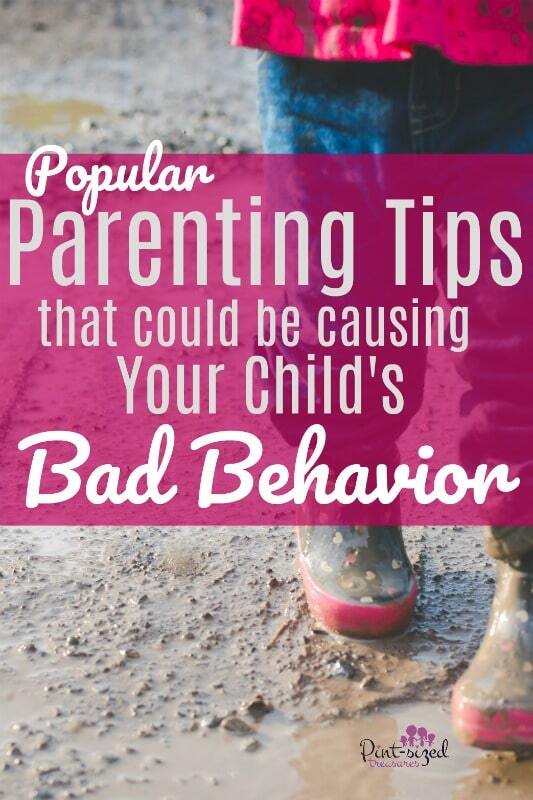 Your child is hoping she will get away with her bad behavior — one more time. And so the tantrum, disobedient saga will continue, unless you firmly decide to go against this parenting trend — once and for all! As a parent who wants to lead and guide, you absolutely must take the diligent road and work through your child’s bad behavior. For your child, your family and yourself, please take time to re-think these popular parenting tips that are causing bad behavior in kids. Try being the parent who goes against these parenting trends and see what a difference it makes in your family. I double dog dare you to be different! May your family be blessed because of it! And if you loved this article, please share with your friends and family! <3 Sharing helps us reach other parents who need encouragement too!